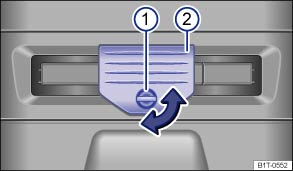 In some vehicles there is a stowage compartment for a high-visibility waistcoat in the driver door . With the tailgate open, open the catch by rotating it 90°. Fold down the bracket ② and remove the warning triangle. A first-aid kit can be stored in the stowage compartment under the driver seat . The first-aid kit must comply with legal requirements. Observe the expiry dates of the contents. A fire extinguisher may be located under the front passenger seat. The fire extinguisher must comply with the valid legal requirements. It must be fully functional and checked regularly. See the testing label on the fire extinguisher. In the event of a sudden driving or braking manoeuvre or accident, loose objects could be flung though the vehicle and cause severe injuries. Always secure the fire extinguisher, high-visibility waistcoat, first-aid kit and warning triangle safely in the holders.